Dushan jade is produced in Dushan, Nanyang, Henan Province. It is also called â€œNanyangyuâ€ or â€œHenan Yuâ€, also referred to as â€œJiyuâ€. Dushan is the nearest provincial forest park, national mine park and tourist scenic spot in Nanyang City, producing the only famous jade of China. Nanyang jade is produced in Dushan, 8 kilometers north of Nanyang City, Henan Province. It is different from jadeite and nephrite which consists of only one mineral element. It is an "alteration gabbro" containing a variety of mineral elements, mainly calcium aluminum silicate. Nanyang jade has a hardness of 6---6.5 and a specific gravity of 3.29. Its hardness is comparable to that of jade. Therefore, foreign geologists call it "Nanyang Jade." The historical position of Nanyangyu has not been seen in the past. In fact, its mining time was quite early, and it was adopted as early as the late Neolithic period. A Nanyu shovel unearthed from the loess of Nanyang County was identified as a product of the late Neolithic period. The seven jade articles in the jade carvings unearthed from the Yin Ruins are all Nanyang jade. Dushan Jade is named for its production in Nanyang Dushan. Located in the northeast of Nanyang City. The jade is tough and delicate, delicate and soft, and the color is mottled. There are six kinds of pigments of green, blue, yellow, purple, red and white. 77 color types are important jade materials for carving art and crafts. It is a famous specialty in Nanyang and is China. One of the four famous jade. Dushan jade carving has a long history and archaeological projections. Before 5,000 years ago, the ancestors had known and used Dushan jade. 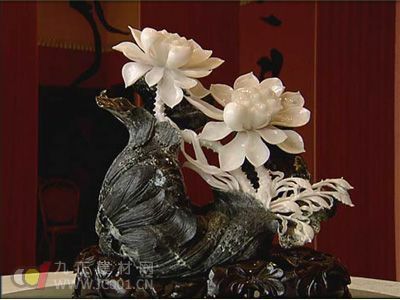 In old China, Nanyang jade carving has formed a large industry, and there are more than 80 workshops in the city. The Dushan jade has been mined for thousands of years, and it is full of caves in the mountains. In ancient times, the jade pits were mostly vertical and generally shallow. Now using blasting technology and rock drills, mining vehicles and other equipment, the tunnel has reached a depth of 100 meters in the mountains, and the branches of the dense spider web are criss-crossed, which is very complicated. Information 1: The mineral composition is mainly basic plagioclase (plagioclase grade An>50, labradorite-pepper-alt-feldspar), pyroxene, a small amount of olivine, amphibole, biotite, may have Trace potassium feldspar and quartz appear. Dushan jade chemical composition is a calcium aluminosilicate rock, SiO2 content of 45 ~ 52%, called basic rock, rich in TiO2, the general content of > 1%. Data 2: Main characteristics of chemical composition: SiO2 is about 41~45%; Al2O3 is about 30~34%; CaO is 18~20%. This indicates that Dushan jade is composed of calcium aluminosilicate minerals. Dushan jade mine also contains trace amounts of copper, chromium, nickel, titanium, vanadium, manganese and so on.